We had a micro introduction to who and why we are. This was followed by expressions of gratitude to Greenall and Florent Books Ltd, for providing lavish drinks and nibbles. Thank you, Simon and Jill! Thanks also went to Chris Barker for setting up and managing our Facebook page and to Susan Barduhn for her talk on International Women’s Day about The Fair List for the EFL Talks ‘Women in ELT’ conference. 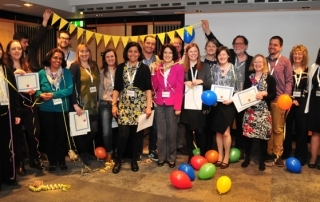 The Fair List, UK is holding its annual awards event at the IATEFL conference in Brighton, UK. The date is Wednesday, April 11th 2018 and the time is 7-9 pm. (Please check the conference programme for the room number) Thanks to Greenall and Florent Books Ltd, there will be drinks and nibbles. Thank you, Simon and Jill! Got a job interview coming up? About to give a plenary talk? According to Amy Cuddy’s TED Talk ‘Your body language shapes who you are’. Just two minutes in private just before the event can help your outcome. 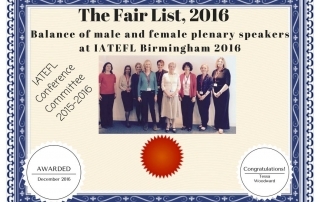 The Fair List awards excellence in gender balance of plenary speakers and panelists at UK ELT events. 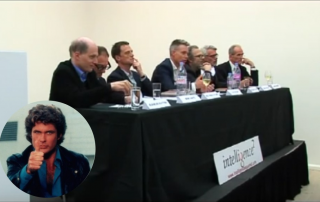 So I was very interested to note a great stirring of interest in the whole business of fair representation on panels. Below are references to three interesting resources. on BBC Trending in May of 2015. 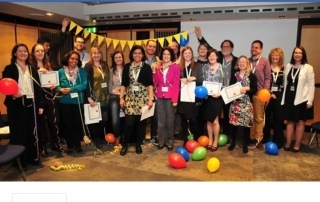 Our annual awards event was held at the IATEFL Conference in Birmingham, UK on April 14th 2016. 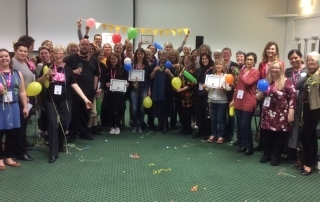 Thanks to all our supporters, we had billing in the IATEFL conference programme, a nice room, balloons, streamers and bunting galore, and drinks and nibbles. It was a cheerful occasion. The Fair List has an annual awards and awareness raising event. This is usually held at the IATEFL international conference in the UK in the Spring of each year. We have the rich web site that you are currently reading. 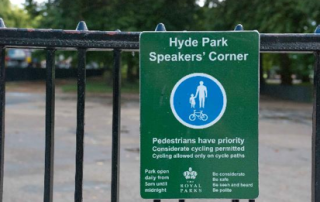 On it there is a useful webinar about giving a plenary talk. All of this is extremely helpful. 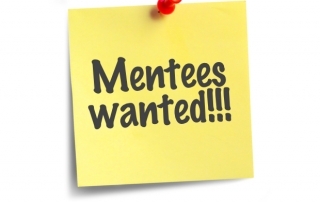 But it might not always be enough to support a first time woman plenary/keynote speaker or panelist at a UK ELT event, So now, with the support of The British Council, we have started up a mentoring scheme. Good news! Sandi Toksvig, the well known Danish writer, comedian and broadcaster has set up a brand new political party in the UK. 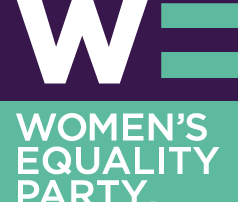 It is called The Women’s Equality Party. You can find out more on Facebook or, if you would rather, by typing this into your browser search box: https://womensequality.org.uk.